While elections in the US are about to take place, on which an approximate $6 billion will have been spent, Kenya is also preparing for very important elections (and consider that the entire economy of Kenya could be run for two months on $6 billion). While I appreciate that people are willing to give to support the party they believe in, the chance that all but the most powerful donors to make a difference in a campaign that is already awash with cash is infintesimal. Dollar for dollar, a much greater impact could be made by supporting grassroots efforts by Kenyans to promote peaceful elections. To that end, I have been helping to create a website to let people know a Peaceful Prevention project led by Friends Peace Teams/AGLI to empower volunteers to act as citizen reporters and to monitor the elections. 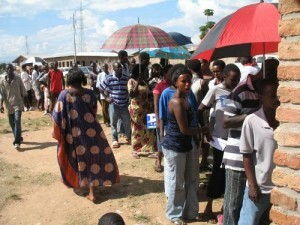 Please see: kenyanelections2013.org. This summer I traveled to Western Kenya to work with the facilitators who are already training volunteers in many parts of Kenya, in particular in the Rift Valley where there was significant violence following the 2007 election. While the elections are still many months away, tensions are already rising due to a number of election- or politics-related incidents, including most recently the murder of a politician in Kisumu that led to protests that killed 3 additional citizens. The aim of the project is to have 1,000 citizens reporting on, responding to, and preventing incidents in their area. 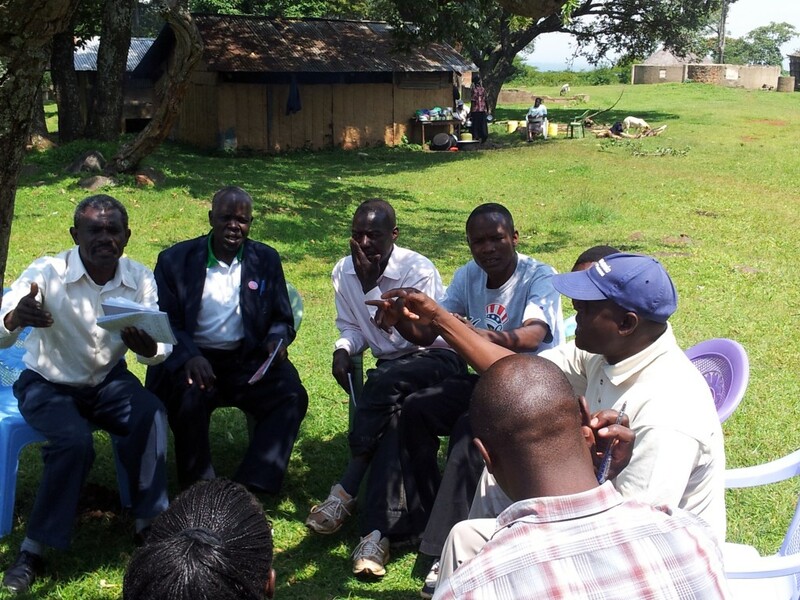 Already citizens involved in the project have been active in helping to resolve a dispute in the Mt Elgon area that threatened to lead to greater violence. As in past elections in the region, AGLI will also be supporting a team of national, regional African, and international observers to oversee the formal election process. Towards this end, we are hoping to raise $15,000 to cover the basic costs of transportation, etc. to allow these Kenyans to engage in work that they deeply believe in, as I saw first hand when I was there in July. One thing I enjoyed about being in Burundi is listening to French news sources such as RFI, which clearly have a different set of concerns than English-language news. US news has more coverage of Latin America, for example, while French-language sources have a lot more about places you don't hear about much in our news, such as Madagascar, or Guinea-Conakry. Insofar as we talk about what is interesting and important to us, the coverage received is an interesting indicator. Considering books rather than news media, using Google's Ngram Viewer, you can see how often a term or phrase has appeared in the millions of books they have scanned, including in different languages. 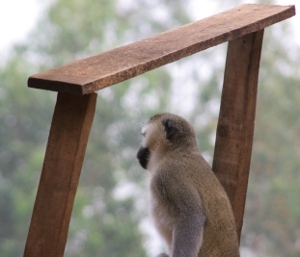 Although Kenya was referenced more frequently than Burundi at first, this changed rapidly as Burundi came within a few years of independence (1961). Then with the Crisis that began in 1993, there was more written (in French) on Burundi than Kenya. So in English, the city of Denver (pop ~2million) is referenced roughly six times more than Burundi. Perhaps more alarming, even with the considerable violence that took place in Burundi in the 1990s, there were more references to the University of Notre Dame, (population: 11,700 students, surface area: 5.1 km2)!! To those who have looked into the literature about Burundi and seen how few books are available, this won't come as much of a surprise. Similarly for other similar conflicts in Africa, even though they are quite complicated, interesting, and important to millions of people. No wonder we have a tendency to think of these conflicts as senseless and impossible to understand – we haven't even really tried yet! party in the pre-election period, to the lack of voting cards for certain political parties, to a claim that the electricity outage in 7 of 17 provinces during the time the votes were being counted was part of a deliberate plan to stuff ballot boxes. The list goes on, and ranges, in my opinion, from rather speculative circumstantial claims to some that were clearly confirmed by the press and other observers. 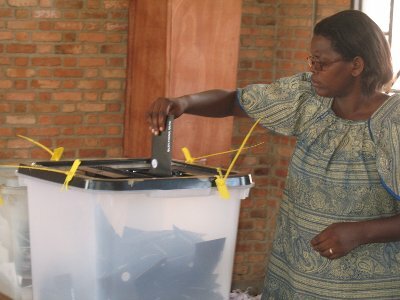 The major groups involved in election monitoring, such as the Catholic Church, the European Union, and COSOME (an organization of civil society groups) have stated that, despite some irregularities here and there, overall the elections were free and fair. To me, it is unfortunate that this message gets reduced to saying simply that things went well, either as a result of the way they present their observations or the way the media represents them. While it is true that many things passed more peacefully than some imagined, to the extent that the ruling party and opposition parties used violence, intimidation, and other unfair tactics to influence the outcome, this needs to be highlighted and addressed, not marginalized under the mantle of all too rosy picture. 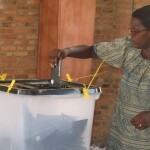 Then yesterday it was reported that five of the seven candidates that were expected to participate in the presidential election have dropped out in protest, claiming that the vote would be rigged in favor of the ruling party. This includes Agathon Rwasa of the FNL, the rebel group that ended their insurgency in 2008 and recently became a political party, and was the largest opposition group. Earlier, when asked how he thought the election went, Rwasa responded that there hadn't been any election. Then yesterday, when asked if pulling out of the race would harm democracy in Burundi his response was that there hadn't been any democracy in the first place. Call it what you will, it puts Burundi in an awkward situation. If things go forward as planned, the incumbent President will run against only two other candidates who have miniscule chances of winning, and it will look like a rather thin version of democracy. Yet the ruling party is unlikely to make significant concessions such as creation of a new electoral commission, since that would admit guilt that they don't take themselves to have. It's hard to know where things will go from here. 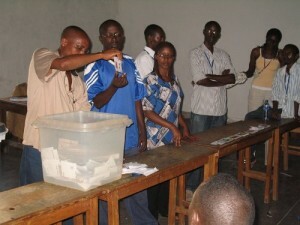 I arrived in Burundi six days ago, just in time to be around for the communal or “district” elections which took place yesterday, the first in a series that will take place over the summer and into September. They were originally scheduled three days earlier, but delays in distributing the elector cards and problems with registration meant that as many as a quarter of the population would have had difficulty voting. 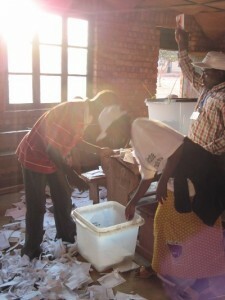 Voting is conducted here by having a ballot for each of the candidates, and placing the card of the desired candidate in one white envelope, and all the other in a second black envelope (the discard pile). There are two potential problems with this system. The first is that there were a number of reports that there were not equal number of cards, which if the election had continued, might have made it more difficult to vote for one party than another. Secondly, if someone is interested in buying votes, they can verify that you have not voted for another party if you bring them the card for that party. In response, this is illegal, and they also count the votes in the discard box, but there are reports of voters taking cards with them. Campaigning is only allowed between 16 days before and 48 hours before the polls open (think how that would change politics in the US…) As I understand it this is meant to limit the conflict that is created as parties campaign. Indeed there have been scattered incidents in the country, ranging from the deaths of party members to attempts at violent intimidation or vote buying to events that escalated into riots. That said, compared to some expectations, it seems from the results so far that the elections have been a significant success, with only scattered and relatively minor irregularities, an overall a tranquil and fair environment. 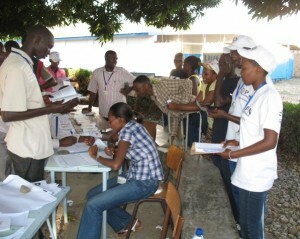 The HROC program, in coordination with the Quaker Peace Network (QPN), was at a number of polling stations overseeing the process, and we will be collecting their observations in the days ahead, and we’ll also be seeing how people respond to the announcement of the winners. Just a quick note, since things here are a bit overwhelming as I try to fit in everything before I head back to the US to start an M.A. in Peace Studies at the Kroc Institute at Notre Dame this fall. 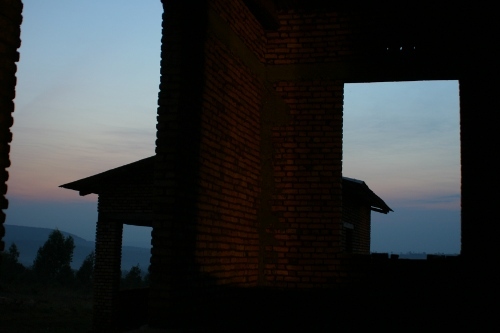 I plan to be back here in Burundi next summer though, and I’ll keep the blog going through the year as time permits. The week before last, I traveled to five communities in the interior of the country to oversee the distribution 150 goats, each goat to a pair of people that will jointly take care of the goat, giving them an excuse to interact more regularly and build relationships. Now, it’s never too hard to give things away, but doing a good job of giving things away is more tricky. In general, I think the meetings we had beforehand where we discussed the program and opened it up to comment and criticism caught many of the little details we had missed in planning the program. But you can’t foresee everything. 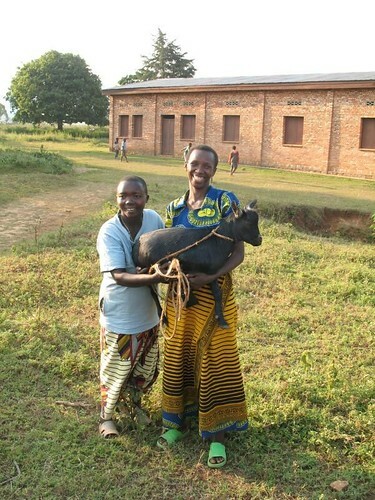 For example, since the goats had to be bought ahead of time, in local markets, some people in the group took on the responsibility of caring for the goats until the time of the distribution. 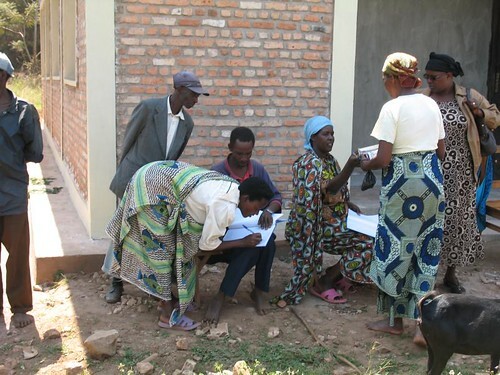 This created problems, however, when one of the women who cared for the goats wanted her choice of goats (and some were already showing signs of pregnancy), while we were trying to ensure a random distribution of goats to keep everyone happy. 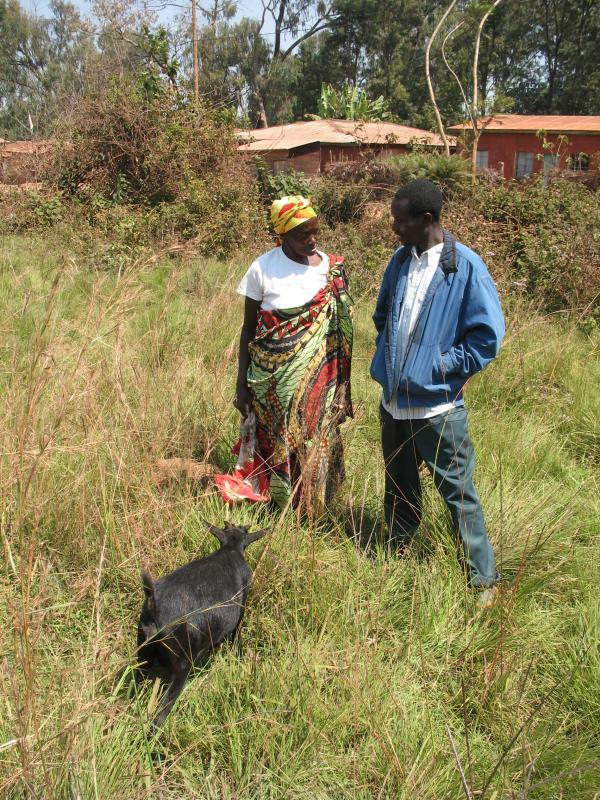 So for a while the discussion became a bit heated over this little dispute, but we all had a good laugh when we learned the name that had been chosen for the goat they were arguing over was “Amahoro” (“peace”). Then the exact same thing happened in a second community. At first this had me concerned a bit, but as everyone seemed to come to agreement, and with a little perspective looking back, it was really just a minor hitch, and yet at the same time demonstrated how much these little goats can mean to people. The best part, however, was the glances I caught four or five times throughout the day of pairs people who were not really paying attention to what was going on with the rest of the group. The reason they were distracted though, was at the very heart of the program. They had become so engulfed in getting to know their partner – formerly someone of whom they might be wary – that they were completely absorbed in being with each other. It was quite striking actually, often they would be holding hands, as Burundians do when having a close conversation, and they were really enjoying each others company. 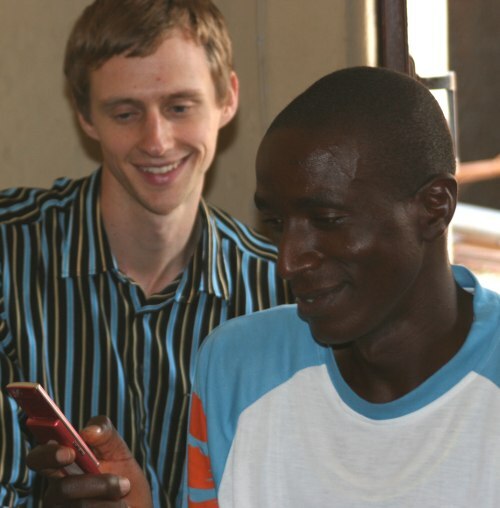 If gentle, nurturing relationships like these can grow from the project among many of the participants, it will have been truly worth its while. 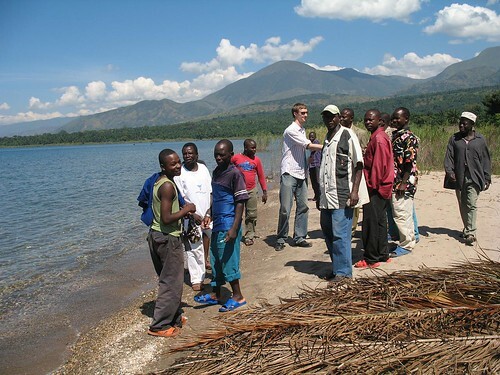 As I mentioned before, I spent most of last week on the other side of Lake Tanganyika in the Democratic Republic of the Congo (DRC), specifically in the city of Uvira, and then briefly in a small town about 25 km south of there called Abeka. 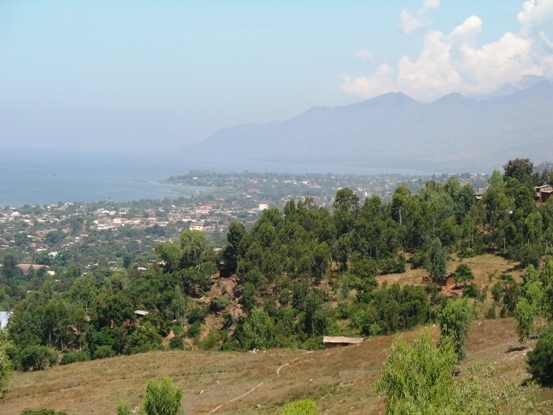 The province of South Kivu had a difficult time during the wars that started in 1996 and 1998, seeing a significant amount of fighting and a number of massacres. 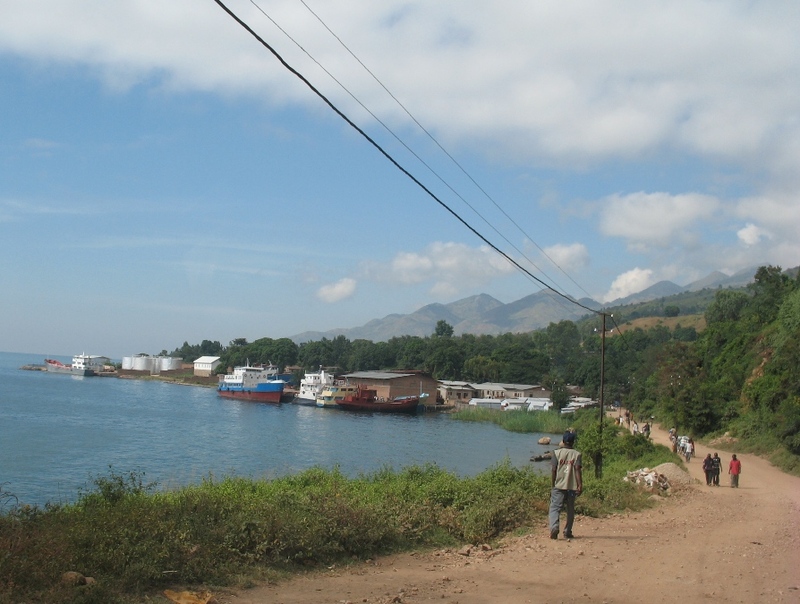 Now though, things are relatively quiet in South Kivu, unlike North Kivu where the conflict is actively continuing. There have been a few isolated events here however, such as an attack on the prison near Uvira that freed the prisoners earlier this year, and violence continues further north in the province, such that the UN has 4,000 peacekeepers stationed here to protect civilians. 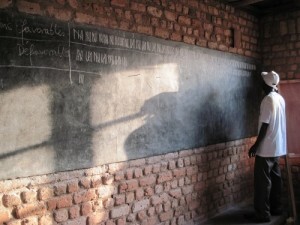 In Uvira, I stayed at a small peace center that was started by the Friends Church in 1999. It is up on a small hill, which makes for a great view overlooking the lake and a good part of Uvira, and surrounded by simple semi-urban area that is quite tranquil. While there, I witnessed a Change Agents Training sponsored by Change Agents for Peace International, and had a chance to chat with some of the participants, who were enthusiastic to use their skills as leaders in their community. I also participated in some informal strategic planning sessions, though most of the outcomes consisted in me having a chance to learn about the different work they do. In the rural community of Abeka, I had a chance to see the first Friends Church in DRC, started in 1983 or so, as well as beautiful site where plans are underway to build a trauma healing clinic, and finally an ill-equipped, but desperately needed hospital. This hospital has been very much on my mind since visiting. The doctor is making due as best he can, performing basic surgeries, with seemingly little more than a scalpel, anesthesia, and disinfectant. 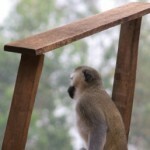 (And growing peanuts and other food in his spare time to supplement his very modest income.) The only electricity currently available is one solar panel that operates one light bulb in the operating room. Actually they have a generator that was donated, but no funds to buy the wires to connect it. And if they did, they wouldn’t have much to connect, beyond a refrigerator. 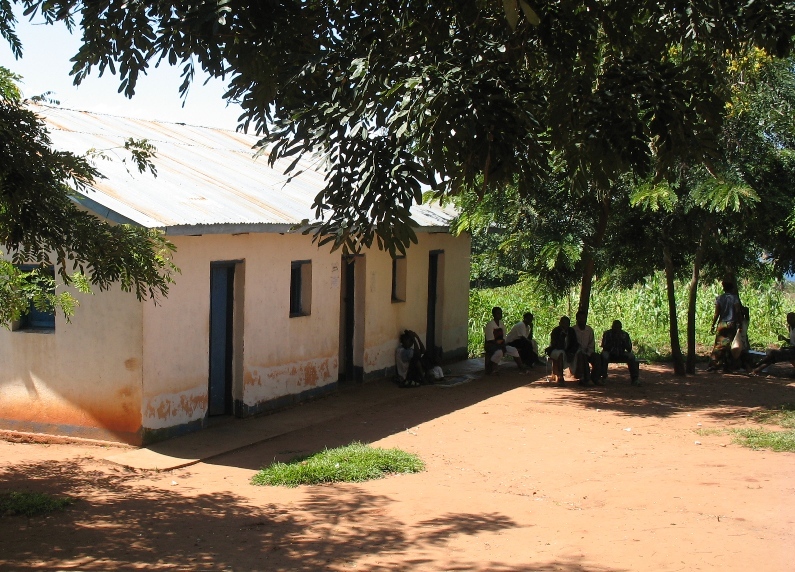 And this hospital serves a wide area south of Uvira, comprising 55,000 people, who can generally only get there by sitting on the back of a bicycle over miles and miles of rugged dirt roads. I asked if the government provided any support. “The government?” one member of the staff remarked, “I have been living in Abeka for more than 20 years and I’ve yet to see the government so much as set foot here.” (Keep in mind that the Kinshasa, the capital city, is located about 1,100 miles away by air, which is the only practical possibility). Part of me says to myself, you have to look at the larger picture, you have to think about the need for the Congolese state to build effective institutions to end the conflict, impunity, and provide healthcare for its citizens. And after all, many in the US are without proper access to health care. Still, in the meantime, a woman rests with her child delivered by c-section, on old mattress, sharing the room with a man whose appendix was removed, and a community and a whole region struggle to survive where a even few thousand dollars would make a signficant difference. Perhaps they cannot wait until the state gets it together, and if it were your mother or your brother, would you be willing to wait? All Quiet on the Quaker Front is powered by	WordPress 1308 and delivered to you in 0.309 seconds using 18 queries.